Day 2 of the Marketo Marketing Nation event was full of excitement, value and insight. First up was the Keynote session titled ‘The Outer Edge of What’s Possible’. Focused on the theme of ‘Be Fast, Be Brave, Be Bold’, this session centered around a discussion with Lindsey Vonn, Olympic gold medalist in skiing. Moving on from the keynote event, the breakout sessions throughout the day delivered great value as well. 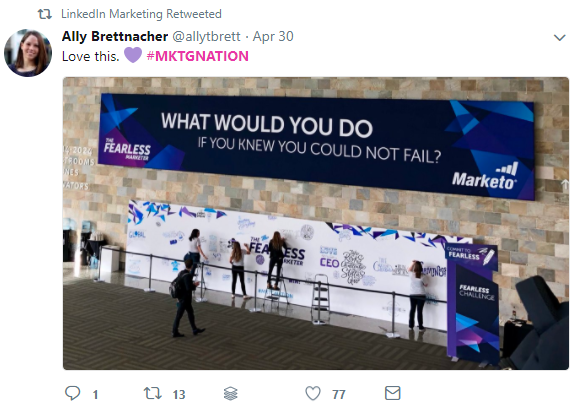 The first, ‘Challenge Your Assumptions: A Guide for the Fearless Marketer’, looked at how to become “fearless” in a marketing context—even in the face of limited budgets, throttled bandwidth, and restricted space to push boundaries. 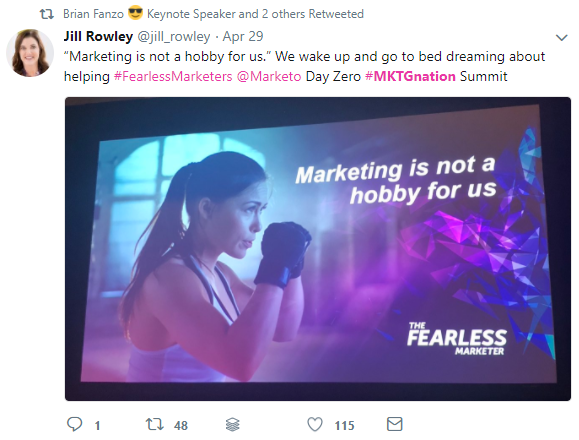 Offering an interesting perspective where the modern marketer mentality was likened to that of a cat who fearlessly walks across the railing of a high balcony, it delved into what the best marketers do to achieve success. The second breakout session of the day, ‘Lead From the Front: How to Break the MOPs Execution Mold and Join the Strategic Planning Table’, looked at the opportunities around contribution from Marketing automation professionals in wider business activities. Marketing automation specialists are perfectly positioned to provide strategic value to their organizations. With technical expertise, the data at their fingertips, and knowledge on how the technology works together, and a philosophy of getting stuff done, they can offer a diverse range of contributions. In the past, far too often these individuals were relegated to just the execution tasks – “build this email”, “send this report”, “launch this digital campaign.” So how have they now broken this “execution” mold and taken a seat providing value to strategic planning and beyond? his session was focused on the importance of getting marketing operations teams involved in the campaign planning process from the beginning. With the rationale that marketing ops teams are uniquely positioned to know what is required, what performs, and can usually reinforce their insight with the correct data points. The speakers in this session were able to accurately predict/forecast a campaign’s performance down to lead conversion rates, could properly assess the value of that performance, and provide the exact amount of hours/resourcing that would be required to achieve the campaign. This process does not cut out other teams but enhances their capabilities by adding marketing ops into the mix, driving additional benefits for all. Marketing ops can help to build a planning and execution process that is informed by data at the top, driven by SLA’s and project management, and that leverages robust outcome-based reporting at the bottom. The final breakout session of the day ‘Mastering Complexity: Building Multi-Product Global Enterprise Environment in Marketo’ looked at a real-life case of building multiple product lead scoring algorithms, engagement programs, and campaign strategies for an enterprise organization. This session looked at how the Verizon enterprise team built out engagement programs and lead scoring algorithms within Marketo. The team categorized users in the database by actions they took on Verizon and separated them into a product flow, or a multi-product flow (multi-product is a catch-all just in case their algorithm is unable to determine which product they have interest in due to them taking many actions on many products). This ensured no lead was missed and all users within the database were categorized. If a user suddenly changed from multi to a specific product, their flow changed also. Users were bucketed into a specific product, or multi-product flows by the actions they took on the site. For example, a form fill had a higher priority of interest than a website visit. 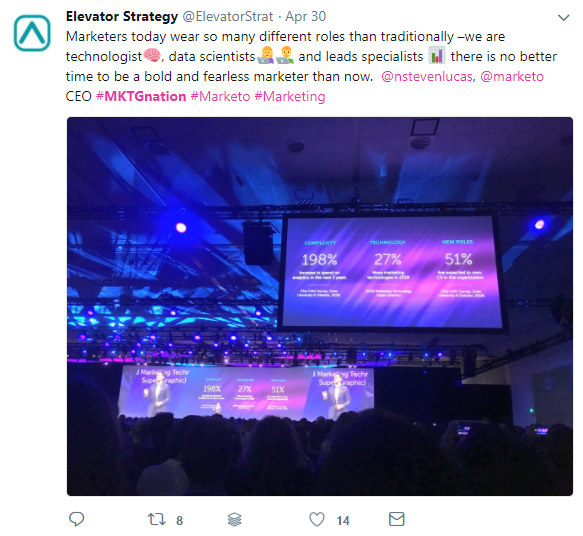 These were the sessions we experienced on Day 2 of the Marketo Marketing Nation summit, so far, it’s been a fantastic experience, unveiling some high-value insight into modern marketing practice. Bring on Day 3!